How to Get the X & Y Coordinates of Mouse Click Points? Free Auto Clicker has a coordinate calculator to get X and Y coordinates calculated if you don’t have the exact X and Y coordinates on your screen. What you need to do is just move the mouse cursor to the place where you would like the program to click and press the spacebar to save the click point. 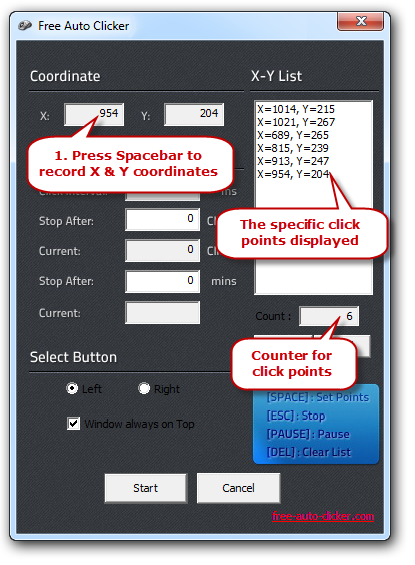 Move the mouse cursor to the place where you would like the program to click, and press the Spacebar so that the X & Y coordinates will be displayed inX & Y boxes, and the click at this point can be saved. It will record one or multiple specific click points in sequence.